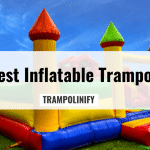 First of all it is important to find the best trampoline for your kids to use. 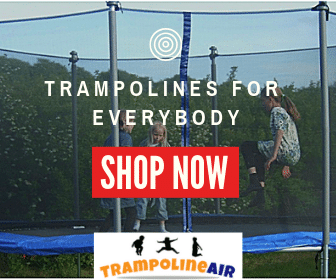 What Are The Benefits of Trampolining for Children? In the age of technology, children aren’t moving around as much as they used to. This causes some parents to be concerned about childhood obesity. For good habits to become a part of a person’s preferences, they should be implemented at an early age. This means less computer time, less video games, and more moving around. 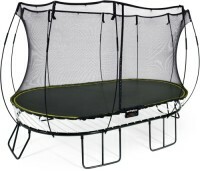 A trampoline is one of the most enjoyable ways to get your child excited about exercising. Ten minutes on the trampoline has the same effect on the body as thirty minutes of jogging. 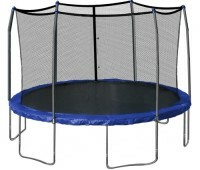 Children won’t feel inclined to jog, but they will feel inclined to bounce and play games on their trampoline. Trampolines will allow a child to bounce with a friend or sibling, encouraging social bonding. 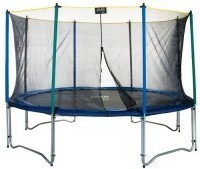 Essentially, using a trampoline is a way to get a workout without feeling as though you’re exercising. Your children will be having a blast, completely unaware that they’re getting healthier and stronger in the process. At What Age is it Safe for Children To Jump? 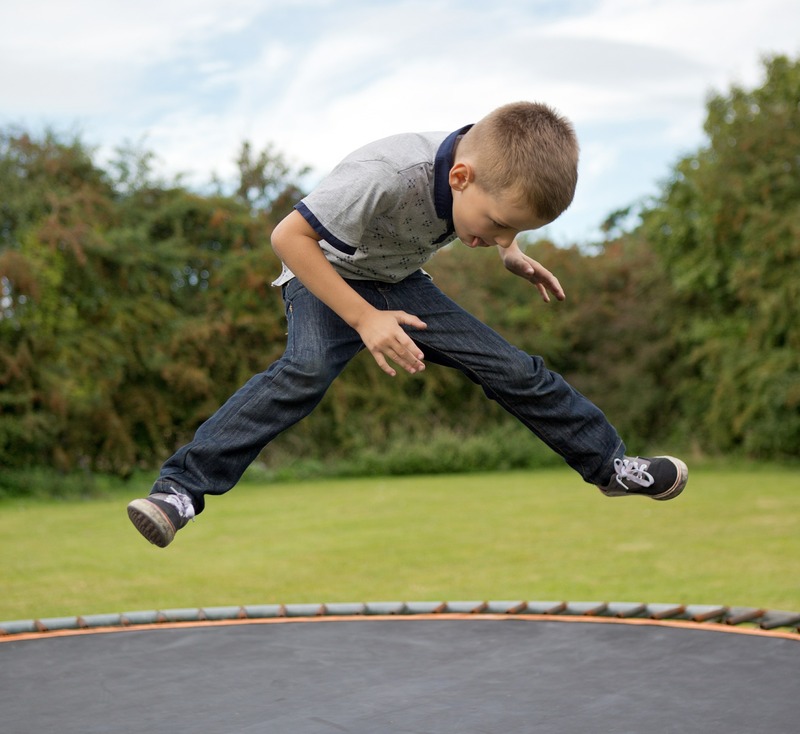 The age at which it’s safe for a child to jump depends on your trampoline. 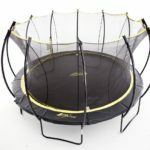 Children from the ages of 2 to 5 are able to jump safely, provided the trampoline is small enough and designed for toddlers. 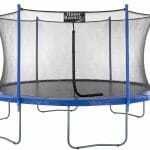 Children ages six and up will be able to utilize a full sized trampoline, as long as it has been assembled and prepared safely. Trampolines are only as safe as the measures you take in preparing them for a child’s use. All trampolines should be equipped with a high quality safety enclosure. You want this enclosure to be made of a reinforced, sun-resistant material with buckles and zippers around the entry that will prevent a child from falling through the doorway. 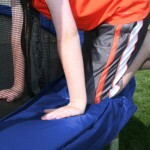 Padding is necessary on the steel poles that support the enclosure, preventing children from being injured when colliding with the sides of the trampoline. All trampolines should be erected on even terrain, free from any debris or structures. The integrity of the trampoline should be routinely inspected. 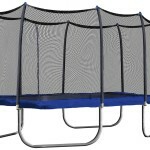 This includes the metal frame, the jump pad, the enclosure net, and the pad covering the springs. Don’t allow children to use the trampoline if you see signs of damage. 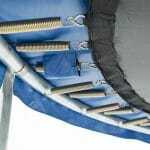 Contact the manufacturer about your warranty (if applicable) and branded replacement parts should your trampoline need to be repaired. When teaching your child to jump on a trampoline, you’ll need to implement a clear list of rules. Always supervise your child closely while they’re using the trampoline to be sure that they’re following your rules. Never allow children to use the trampoline without an adult present. The act of jumping is easy for a child to learn on their own, because there isn’t much to it. The act of jumping safely involves certain measures being set in place. When children are first learning, make sure that only one child jumps at a time. While children enjoy jumping together, you’ll need to be sure that they understand how to work with gravity before they’re allowed to jump in unison. 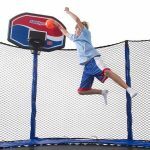 Injuries can occur from jumpers bouncing too closely together, especially when they’re still discovering how to use their momentum. After everyone gains a little experience, it will be safer to allow two children to jump at the same time. Jumping in the rain may seem fun, but it’s dangerous. A wet mat will make it easier for little jumpers to lose their footing, and this can cause them to get hurt. Since trampolines are made of metal poles, this makes them dangerous to use when lightning is a looming threat. Jumpers should only jump when it’s sunny, and should return inside at the first sign of inclement weather. Children should only jump on a trampoline while barefoot. Shoes may cause a bouncer to slide around the surface, and socks are bound to do the same thing. The bare sole of a jumper’s feet interacts best with the jump pad, especially for grip and traction. When jumping on the trampoline, children shouldn’t have anything in their pockets. Jewelry like bracelets or necklaces can get snagged or stuck, so prevent this risk by disallowing them. Children with glasses should also exercise caution. If they can go without their glasses on the trampoline, that’s best. If the need them, prevent them from jumping around other children. 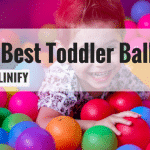 Imagine the injury your child may receive from falling on a hard, plastic toy. Even if your child doesn’t fall on this toy, anything with hard edges can cause tears or snags in the jump pad and safety net. 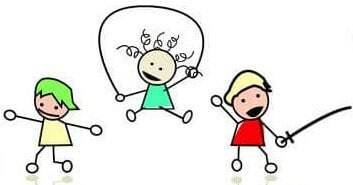 The only toys that should be allowed on the trampoline are soft toys, such as inflatable balls for trampoline basketball games. For maximum safety, don’t allow children to jump while these toys are being used on the trampoline. Children are adventurous. They’ll want to do things like somersaults, cartwheels, and backflips on the trampoline. If they haven’t been taught how to perform these tricks by a professional, such as a gymnastics teacher, don’t allow them to do them on the trampoline. Since bouncing adds a new layer of complication to a trick, children are risking head injury if these tricks are improperly performed. As your children learn and grow, they’ll want to experiment with the trampoline more. Start by monitoring them closely, gradually increasing their amount of freedom as you become comfortable with their skill level. Older kids will be able to do more, but younger children require more experience.